According to the chairman of the Papuan Baptist Church Alliance, Reverend Socratez Yoman, the human rights abuses perpetrated over the last 10 years by the Indonesian security forces against the Papuans must now be regarded as a humanitarian issue. He goes on to call on the government of New Zealand to engage in a productive dialogue with both the Indonesian government and the international community, in order to push negotiations forward to cease further rights violations and solve the West Papua case. A church leader from Indonesia's Papua region who is in New Zealand raising awareness about conditions in his homeland says West Papua is a global humanitarian issue. 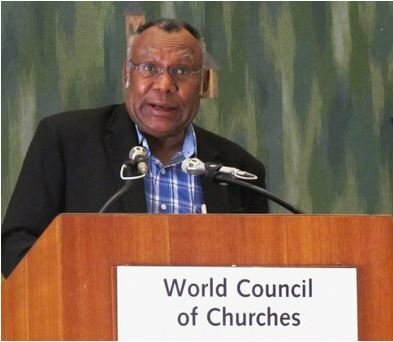 The chairman of the Papuan Baptist Church Alliance, Reverend Socratez Yoman says abuses against West Papuans by Indonesian security forces have not abated since his last visit to New Zealand ten years ago. According to him, transmigration and Indonesian government policy have steadily left the Papua region's indigenous people marginalised demographically, culturally and economically. Reverend Socratez told Johnny Blades that despite the new president Joko Widodo vowing to help Papuans, the Indonesian state is distrusted. SOCRATEZ YOMAN: Their character they never change and also their attitude never changes. They change their clothes their heart never changes. Papuans are undermined, they ignore Papuans. This is our direct experience, our daily experience. West Papua is dominated by migrants by Indonesians. A lot of military in Papua, they are removing, a genocide of local people. This is a humanitarian problem, as long as the Indonesian government continues to commit human rights abuses this is a humanitarian problem this is a global issue, a global concern. My concern is my people, the owners of the land how come they are treated like animals. JOHNNY BLADES: Does the government have any control over the security forces there? SY: Now in Papua it is not civil government control know it is military control, the civil government is powerless. For example when the President SBY , Susilo Bambang Yudhoyono period we met him, 16th of December 2011. We met him in his residence we are asking him and conveyed that to solve West Papua cases peacefully negotiations. But he said to us, he replied that okay I am willing to solve West Papua cases through peaceful negotiations but behind me are hardliners that say no. Our question is why? Here is a former military general, how and the second thing is you were elected by 300 million he has power how come he is controlled by the hard liners? But now Jokowi he is civil, he is powerless he has many time visited Papua, he plays games. He wants to tell the international communities you see I have visited Papua many times. West Papua does not need a lot of visits, we need real action. For example when the president Jokowi released five prisoners, this is real action, this is real action. We need like that. And he is also now constructing the long roads in West Papua. West Papua does not need long roads, who will use those roads? It is the military who will use them. JB: Many times you have called for dialogue but dialogue with a third party like in Aceh. Are you still calling for that? SY: Yes this is our standing we are church leaders, I as one of the church leaders from West Papua this is their way non-violence way is dialogue is the way. Now our call is a long time stand of ours in the media and all over the world. They said okay now Indonesia and West Papua go around the table to talk mediate by third party for example Aceh. Why Aceh they solved? Indonesian government they solved Aceh cases mediated by international communities why not? JB: What is the difference? SY: Yes what is the difference, this is our question, why? By now Indonesia it is too late, too late to control West Papua. JB: You were asking for New Zealand help 10 years ago and further back. So what do you want the government to do? SY: Yes so we need the New Zealand government to engage with their counterparts Indonesia government to open the way foreign journalists to visit Papua to gathering our coverage of what is happening inside. And also secondly New Zealand government also to engage with counterparts dialogue peacefully on negotiations to solve West Papua cases. West Papua today has become a part of Melanesian communities and they are like a lost son returned to his own family. And Melanesian communities or in Pacific communities the West Papuans are very happy because they come back, return from the other people. Vanuatu is the strongest long-standing supporter of West Papua. Now Solomon Islands supports West Papua, now Tonga and the Kanakys. And Fiji okay the government is friendly with Jakarta but all the churches and grassroots one hundred percent they are with Papua. PNG also the people they see our people, their people from their heart they see they are suffering. The West Papua suffering is Melanesian suffering. JB: So all this international support which is growing, grassroots support which is growing plus the things like the London summit and the MSG focus on West Papua. Is that having an impact? Is Jakarta taking note? SY: Yes Jakarta now should be aware yes and understand that West Papua is not alone anymore. Now West Papuan people have many friends and a lot of solidarity's in each corner of the world today now it is my prediction that West Papua will increasing its demonstrations, big huge demonstrations will be will come. Because now where they are now they have friends now all over the world support them. Now they have got like moral support. JB: Do you have trouble getting out? I mean you have left the region last week to come here have you had any trouble? SY: No no no I am a church leader. Who will interrupt me, I am talking about my own people. This is my responsibility I am an educated man, I understand what is happening, I will not be silent anymore. Historically I understand the background, what happened in 1969. I know I learned about that. I have written 19 books about West Papua. No we not be silent anymore when the West Papua undermine their dignity their life, their future, we will speak everywhere now it is time. Nobody is stopping us.